A Bloggers Christmas Party In York. A Northern Bloggers Xmas Party. I love social events. I love Christmas. I love seeing people I don’t see that often. 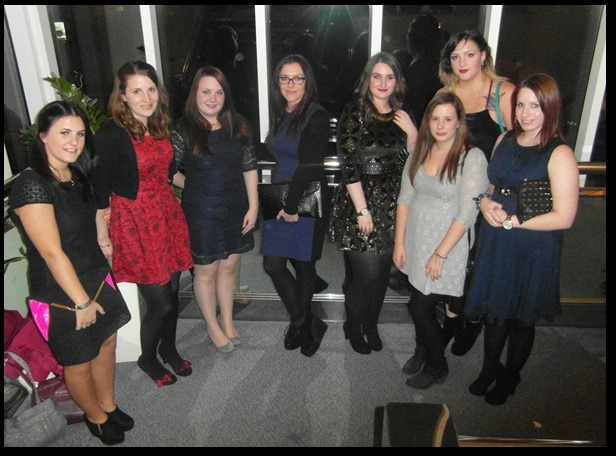 So when I received an email from Rach, saying she was organising a bloggers Christmas party, I couldn’t wait! The party was held at the Park Inn by Radisson Hotel, York. The guest list was small, but consisted of 8 local bloggers, which made it all that nicer. Rach also had the great idea of having a Secret Santa, with a budget of £5. It did take some thought, but I was quite happy with the gift I had chosen. I received a great secret Santa gift. It was a make your own babies handprint Christmas tree decoration! Absolutely brilliant! Can’t wait to make it next year with the baby. The menu was simple but yummy. It was optional throughout, with the main allowing you to help yourself to vegetables, Yorkshire puddings etc. We all happily tucked into the 3 courses, some ending with coffee and a chocolate. Then the noticeable notes of Mariah Careys’ ‘All I Want For Christmas’ came through the speakers and the cheesy music and dancing began. This led to Beyonce’s ‘Crazy In Love’, with some, to be desired, body popping movements by some ladies on the dance floor. It killed me to not be involved in the Gangnam Style dance, but I didn’t think baby butterfly would be able to cope with a 3-course meal and the jiggling, but I did head to the dance floor with Sally, Sam and Sarah to bust the moves to Cha Cha Slide. We had some photos taken in the lobby area by a kind hotel worker and each had photo’s taken next to a festive Christmas tree. It was a fab evening, with not enough thanks to Rach for organizing and also for the extra little goodie bags which she gave to us all. I really can’t wait to put my decoration on my tree next weekend. It was great to see the ladies socially and out of the ‘normal’ blogging environment and think we all get on really well. Looking forward to our next meet up and another bloggers Christmas party! Our Baby Week At 30 Weeks. I love meeting up with the bloggers from my local town, and I've made so many new friends through blogging. Starting my blog was one of the best things I ever did.